The Conservancy is a 232-acre environmental education center with 4 miles of trails open every day. There are guided hikes and special events year-round. Founded in 1990, this non-profit helps to preserve the natural environment, agricultural farmland, and unique historic sites in the county. In 2009, a community garden was started with over 70 plots to help produce nutritious food locally. 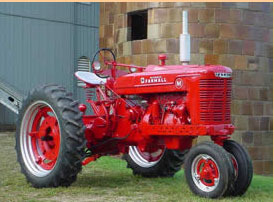 Since 1995, the Howard County Antique Farm Machinery Club, a non-profit group, has worked to preserve the agricultural heritage of the county. The members of the club run the Howard County Living Farm Heritage Museum, which provides educational activities for all ages throughout the year. Sales and service of farm, lawn, and light construction equipment. Buy and sell bulk grain. Small, family farm offering horse boarding, lessons, trail riding, and showing. Just This Side of Paradise Farm is a fully operational ornamental tree farm and nursery. This farm runs on alternative energy and is an off grid showcase. Larriland Farm offers pick your own vegetables, fruits, cut flowers, and herbs from late May to the first week in November. From October to early November you can take a hayride, pick a pumpkin, or enjoy the fall activities at the farm. Larriland Farm was founded by Larry Moore in the late 1960s, and is now run by his three children. Before starting Larriland, Larry Moore and his father operated a dairy farm and a sod farm in the county. Angus beef born and raised in Clarksville, no hormones or antibiotics. Whole, half, quarter animals available. Beef processed at Mt.Airy Meat Locker by Wagner’s Meats, LLC.